Inside a recording studio, musicians get the opportunity to bring their sounds to life. Whether it’s taking that live sound and replicating it or creating an entirely unique experience, recording studios are both magical and demanding. Musicians can spend days, weeks or months inside of one, trying to produce the perfect song. Length of time in the studio is no match for Tom Evanchuck, however. It’s the process after recording that took the most time for his latest EP, Just Got Back. Between mixing and mastering, creating a game plan for its release and figuring out the best approach to getting it out in the world, Evanchuck sat on this album for a few months before sharing it with the world. With help, he enlisted a group of talented musicians from the Cleveland area and gave them a week’s notice to step into the studio with him. Here’s the catch: none of them had even heard the songs before that day. Here’s an even bigger catch: all eight tracks were recorded that day. On a normal September morning, Evanchuck went in with eight solid tracks that meshed well together and gave each musician the chance to get a feel for the song before ultimately recording it. After finishing four songs with the full group, he wanted to keep going. It came to a point where the eight songs were polished enough for him to consider them complete, but he wasn’t at the typical 10 or 12 songs that are usually seen on a full length. At first, he wasn’t sure if he should keep going and try to push out a few more songs or go with the eight and see what happens. The final product became Just Got Back, named after the first song he wrote for this album. The artwork is a drawing done by his father when he was in high school. It’s something Evanchuck always wanted to incorporate into his music, but didn’t make sense to use in any of his projects… until now. 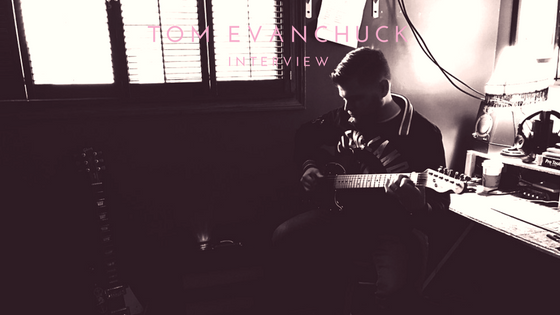 The spur-of-the-moment, laid-back EP that is Just Got Back is a different feel to previous work released by Tom Evanchuck. It’s a more mature sound with a twist of his Americana roots. As the release of this EP starts off his new year, it’s likely to be his year for the taking.